Haplophryne mollis. Female anglerfish with tiny males attached. Anglerfish are marine fish that belong to the order Lophiiformes. Anglerfish are noted for having a bait-like appendage in front of their heads, right above their mouths. The appendage, which resembles a fishing pole, is attached to the end of the dorsal fin's front spine, which is separated from the rest of the fin. 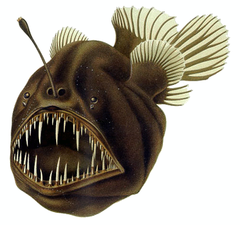 Anglerfish light their rod with bioluminescence (their own light) and then wiggle it to mimic a small marine animal. When other creatures come to eat the small marine animal, the anglerfish eats them. They are called anglerfish because they catch fish with bait, just like anglers, who use a rod and line (rather than nets). One of the families, the Ceratiidae, has an extraordinary mating system where the male actually fuses into the female. A mitochondrial genome phylogenetic study suggested that anglerfishes diversified in a short period of the Lower Cretaceous, between 130 and 100 million years ago. ↑ "Anglerfish, Anglerfish pictures, Anglerfish facts - National Geographic". animals.nationalgeographic.com. 2011. Retrieved February 4, 2011. This page was last changed on 17 October 2017, at 03:13.